While we were in graduate school, my then-girlfriend and I both became debt-free, and you can too. Graduate school doesn’t have to wreak such havoc on your finances that it takes decades to recover. Here are eight tips for how to eliminate debt while in school. The Hippocratic Oath is an oath taken by doctors to practice medicine ethically. Part of the Hippocratic Oath is to do no harm. Of course, it makes sense that patient health interests should be at the forefront of providers’ minds. I think this is also applicable to eliminating debt. A key objective during debt elimination is to do no additional damage to your finances by adding more debt. Trying to borrow your way out of a financial mess is essentially adding more financial stress and risk to your life. For example, moving your credit card debt to your house via a home equity line of credit (HELOC) may decrease your interest rates but also puts your house at risk should you default. Such activities are typically counter-productive and unwise. Don’t look for a gimmick, because there is typically no substitute for applying tough discipline and hard work for a finite period. Remember, you’re executing a plan that can lead you toward financial independence. Don’t take my word for it; according to the Forbes 400, 75% of the 400 richest Americans say the best way to build wealth is to become and stay debt-free. Even with this knowledge, it is still sometimes hard to avoid using debt. Preparation for emergencies is one of the best ways to decrease the likelihood of going into further debt. While eliminating consumer debt (e.g., car loans, credit cards, and student loans), maintaining a starter emergency fund is often enough to catch most problems. For most people, this means keeping around $1,000 saved exclusively for emergencies (this is done before you start paying off debt). The biggest caveat is that you must have both the ability and the motivation to reasonably pay off the debt within a short period. If you know it’s going to take you four years, that’s a completely different story. You should seriously consider a side hustle, especially if you are a salaried employee or overtime is unavailable. A side hustle is some income-producing part-time endeavor. For most people, this means getting a part-time job. By bringing in some extra income, you can accelerate your debt-freedom tremendously. If your school imposes limitations on work, you still have some options. For example, if you are more entrepreneurial, consider working for yourself via your own business. You could sell stuff on eBay or Amazon, market your expertise as a consultant, or become a virtual assistant, among other things. Remember, there are only two sides to the equation: input and output. Most people can only cut back on their budgets by only so much, so increasing your income is another viable option that should not be ignored. Don’t be afraid to be unconventional with your side hustle. It certainly doesn’t have to just be for a supplemental income per se, it could be your primary income. It takes the same effort to think small as it does to think big, so why limit yourself and your income? For example, instead of being a part-time baby-sitter, you may decide to earn a few thousand a month by flipping cars or teaching executive seminars. Additionally, if you choose to go into business for yourself, you may decide that you enjoy being an entrepreneur more so than having a job in your primary major. Also, feel free to integrate your interests and your school major into your side hustle. For example, you may decide to tutor or teach a subject related to your field of interest. One way I leveraged my income as a tutor was by doing private group sessions. Remember that not everyone has your expertise, so don’t disqualify yourself to work or consult in your field of interest just because you feel like a novice. Think about a win-win solution: Not only can you help the people you are serving by sharing your expertise, but you are building your reputation while earning extra money. Sure, you have worked hard to achieve your position, but that doesn’t sanction you to be financially irresponsible. 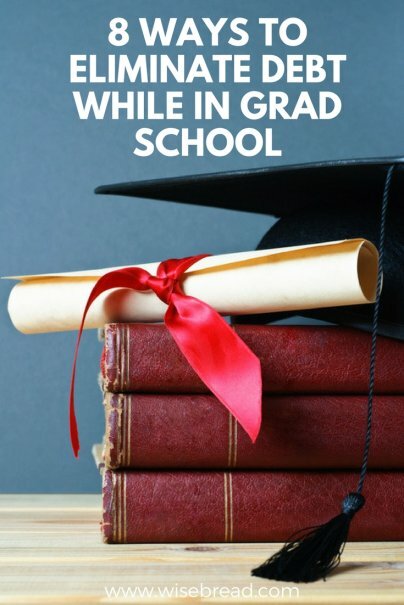 So many people work so hard to achieve academic and professional success that it is easy to forgo discipline and yield to a sense of entitlement after finishing a bachelor's degree. With all that hard work put into your education, you might be tempted to say “I have earned this.” Unfortunately, entitlement can be the death kiss to your finances. The problem with ignoring debt in graduate school is that the financial implications can be great. Debt can restrict your choices — where you live, the jobs you take, when you start your family, etc. Additionally, some people add to their debt while in graduate school despite stipends and tuition reimbursement. These people end up in an even bigger financial hole than before they began. This isn’t necessarily financial prudent despite earning a degree that has the potential (and likelihood) to increase your lifetime earnings. It is important to resist this tendency and commit yourself to eliminating your debt even while in school. Personally, I put my planned repayment schedule on the refrigerator, so I could stay motivated, chart my progress, and count down to my freedom! Remember, the dream is the fuel. Don’t hesitate to apply for fellowships even if your tuition and stipend are covered. There are still additional monies to pursue that can have a tremendous impact on your quality of life and your bank account. One of my friends was able to double his stipend by successfully obtaining a competitive fellowship. This required no additional work on his part other than writing the grant and providing annual updates to the funding agency. Additionally, some fellowships cover fees and costs associated with traveling to conferences, both of which can be significant. For example, student fees at some universities can exceed $1,000/semester. Don’t be blind to the true financial implications of choosing particular majors. I know some would like to treat the costs of attending school, employability, and the actual education obtained as if they are mutually exclusive, but life does not work out that way. Think long and hard about your employability after you graduate. Correlations have been found between majors with the most funding for stipends, tuition, and research and the ease of finding employment afterwards. This doesn’t preclude pursuing other majors, but make sure that you have an economic model in place to support your efforts. This may mean having a working spouse or a side hustle (see tips two and three above). Just because you love philosophy is not enough reason to pay the price for that degree for the next 40 years! Also, keep in mind that subtle distinctions in degrees can also affect your employability in certain fields. For example, having a Masters or Ph.D. in Public Health is considered more marketable for some positions than having a Ph.D. in Health Policy despite the overlapping coursework and expertise. In short, costs and benefits (future employability) must be factors in your higher education decisions. This is not to say don't have kids while in graduate school, but if you do, consider the ramifications. For example, it would be practical for most families desiring to have kids to halt their debt elimination plan and pile up cash until after the child is born. One reason for this is to make sure you are not stuck with only a starter emergency fund ($1,000) with a child on the way. Also, depending on your income, saving may allow you to have the baby without incurring medical debt. Remember, this halt is just temporary, and you can resume debt-elimination efforts upon your child’s birth. Any extra money saved during the pregnancy can be applied to the remaining debt. Having a child is such a joyous occasion, so taking a little bit longer to reach your financial goals is small sacrifice in the big scheme of things. Just be realistic about your budget, and you will be amazed by what you can accomplish. Why Do We Save Anyway? The Problem With Being Budget Minded Is Other People! "For example, having a Masters or Ph.D. in Public Health is considered more marketable for some positions than having a Ph.D. in Health Policy despite the overlapping coursework and expertise." Please do tell. I have an MPH and have never heard of a person with a MPH being considered over a PhD in health policy, and cannot imagine that this would be true based upon degree alone.